Getting tired of the same old meals at dinnertime? 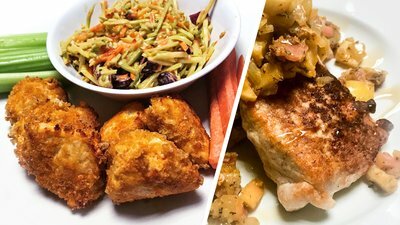 Add unique flavors, and a bit more protein, to familiar entrees with these Pro JYM recipes. I recently issued a challenge to one of the most culinarily gifted members of the JYM Army, Steve Flintoff. Previously, Flintoff created the recipes for my "4 Physique-Friendly Breakfast Recipes" article here on Bodybuilding.com. This time around, Flintoff's challenge was to come up with Pro JYM dinner recipes. The goal was to add some new flavor to already high-protein meals containing chicken, pork chops, beef, or bison. It took some experimentation, but Flintoff finally came up with some amazing Pro JYM dinner meals. In fact, he even found a way to substitute my brand-new Mass JYM powder for Pro JYM in one of his pork chops recipes. In these recipes, Pro JYM and Mass JYM are included more as a way to add flavor than to boost protein content, since the meats themselves already contain plenty of protein. If you tend to eat the same foods every week for dinner, Flintoff's recipes will help shake things up for you, all while keeping your dinners macro and physique friendly. Enjoy! Come on, you know you're looking for something new in the chicken-wing department. Are you ready for banana or gingerbread wings? No time like the present to give them a try! Nothing goes together better than pork chops and apples. This recipe goes one step further and puts all your comfort flavors together: apples, bacon, and maple syrup. These chops will have you patting your stomach and feeling fine! Legend has it that a stiff wind through the kitchen led to the creation of mole sauce—an unexpected combination of sweet and savory tastes. Make yourself some complex, tasty, spicy mole, then spread it on a street taco. Doesn't get better than this! This recipe will blow your mind. Like the food version of a mosh pit, it slams together bison burgers, peanut butter, chocolate, marshmallows, and more to rock your taste buds six ways to Sunday. Find more great recipes at JimStoppani.com.